In general: As a shaft and a bearing should have a tight fit, there is some force needed to separate them even in a new condition (if they have a loose fit, any movement can lead to grinding down the parts). Often heating the whole part helps a lot, as the bearing tends to get larger, sometimes the bearing comes out of the housing and you can use an extraction tool to remove the bearing from the shaft. Heating helps to weaken baked grease as well. Using a thin oil can help to solve grease and dirt too. If this is a standard sized bearing, I would replace it with a new part afterwards. Due to aging the capacitor almost likely get a short circuit and will blow up. Replace it in advance by any 1 uF 275 or better 400V AC type. This is the first I do when I put my hands on a Lo15. I hope it will not be necessary to replace the bearing. I already tested the motor after applying more grease to the front bearing. It runs quiet when applying around 70 Volts DC and consumes 0.35A when free running. I wasn't really thinking of removing the bearing in the first place, but to remove the governor assembly from the motor axis. There was one single screw that seems to be the one to unscrew to get the governor loose. I have also used a very thin spray oiled used for loosening stuff. But yet there has been no success, unfortunately. Applying some gentle heat might be the next try, thanks for the tip. I have been searching for carbon brushes. 99 % of what is available are rectangular. Only a few are cylindrical. However I found a British internet site that offer brushes for obsolete machines. Maybe they can help. Then onto the springs for the pull bars. 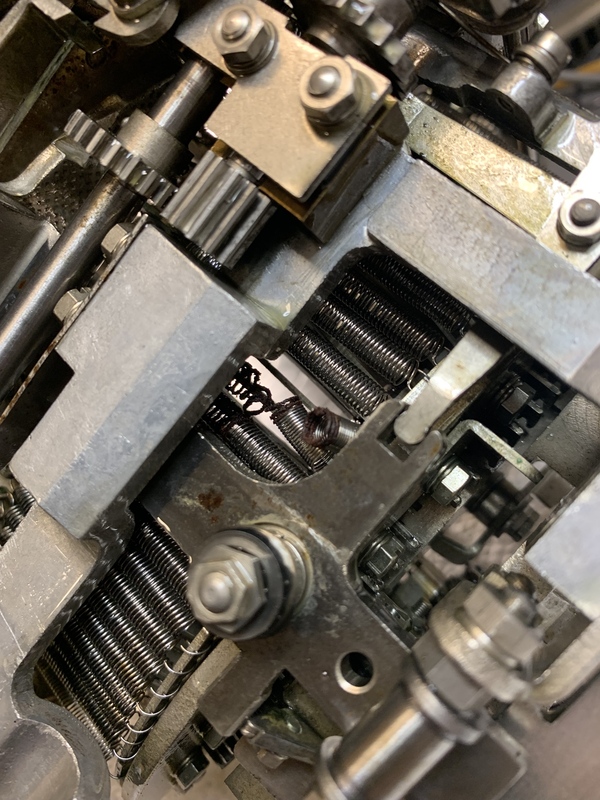 Do you think the springs made for the original Teletype model 15 would fit? The appearance is very similar. I read somewhere that approximately 75% of the parts are compatible. I am not sure this is true. It make sense that the capacitor hasn't aged that well. After all it was manufactured in 1957 according to the date code it. Replacing it shouldn't be a problem. Speaking of manufacturing date. Is there any way to deduce the manufacturing date of the entire machine? It has to be somewhere after 1957, that is all I can get from the date codes of the two capacitors I checked. Which spare parts do you need in particular? I have many Lo15 spare parts on stock and also spare brushes. I don't have the parts guide so I have no idea of the part numbers. * Immediate need for three springs for the pull bars in the typing carriage. Like the ones in the picture of the up-side-down typing carriage below. The broken one can be seen in the middle. * Very good to have: Two or three carbon brushes for the governor of the motor assembly. * Would be nice, but not necessary: The white twist knob to turn on and off the reperferator is gone. Would be really nice to have a complete machine.